There’s no question — the No. 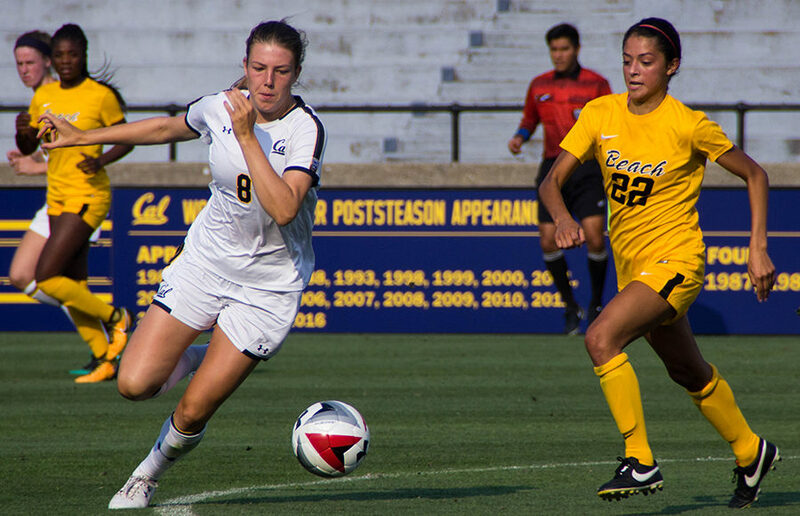 13 Cal women’s soccer team has found its groove. With seven wins and only one loss, the Bears have risen through the NCAA ranks and are now preparing to face their Pac-12 rivals. Coming off of its best performance of the season this past weekend, with a pair of wins against Oklahoma and then-No. 14 Oklahoma State, Cal will head to Washington this Saturday to take on its first conference opponent of the fall. The Bears have won three of their last five games against Washington, including a 4-1 win against the Huskies last year. Cal has power located all over the field: junior Miranda Nild and sophomore Abi Kim lead the team with four goals each, and the Bears have outshot their opponents 126-53 so far this season. On defense, Cal has had four shutouts and only four goals scored against it. Senior keeper Emily Boyd has made 18 saves this fall and recorded the 30th shutout of her career against Oklahoma State, making her the eighth player in Pac-12 history to hit this mark. As if they didn’t have enough going for them, the Bears dominated the conference awards this week as freshman Emma Westin earned Offensive Player of the Week, senior Indigo Gibson took Defensive Player of the Week and Boyd was awarded Goalkeeper of the Week. Cal is only the second school to sweep the weekly awards in the last three years. Washington has also had an impressive season with seven wins in nine matches, including one against then-No. 2 Florida. Senior offensive duo Shannon Simon and Kimberly Keever match Nild and Kim with four goals each as well. Arguably the Huskies’ most valuable player is redshirt senior goalkeeper Sarah Shimer, who has made 24 saves this fall and lowered her career goals-against average to 1.04, placing her third in Washington history and just .02 points behind former U.S. Women’s National Team starting goalkeeper Hope Solo. With both the Bears and the Huskies on a five-game winning streak, this game will not be a breeze. It will be difficult, it will be hard fought, and most of all, it will be decisive. Cal has had a strong start to the season, but the real challenge will be maintaining this energy and channeling it towards a single goal: the Pac-12 championship. Sophie Durham covers women’s soccer. Contact her at [email protected].